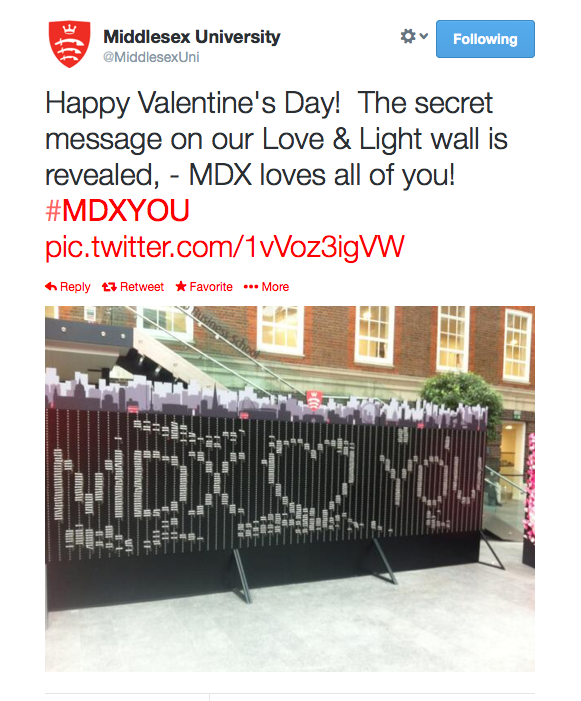 Valentine’s Day 2014 gave us the opportunity to take a snap-shot of social media activity across education in both the UK and US and we were impressed. Not only were institutions embracing the idea of news-jacking something topical, but many did so with a strong grasp of what works so well now – real-time, photos, videos, and simply great creative ideas. Here’s a dozen red roses for you. We’re not sure of the story behind this, but it’s great to see Middlesex University doing something intriguing in the real world and then share further in social media. An excellent way of showing love for their students. 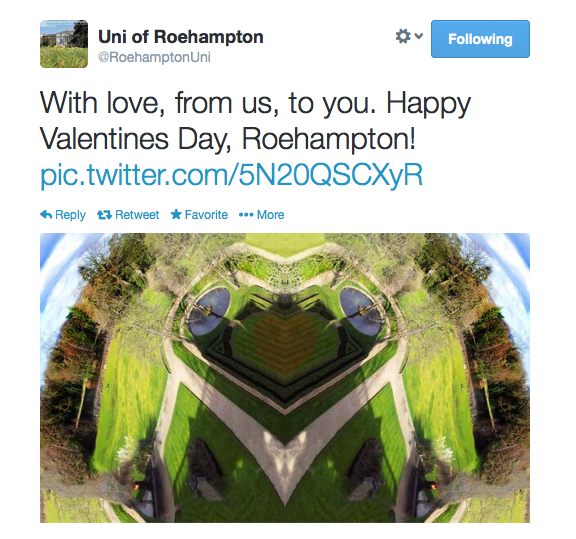 We saw lots of examples of campuses featuring in social media Valentine’s stories. Roehampton University took the chance to show off its beautifully green South West London campus with a love-heart view. Not a bad idea considering that creative photos hold powerful stock in social media. 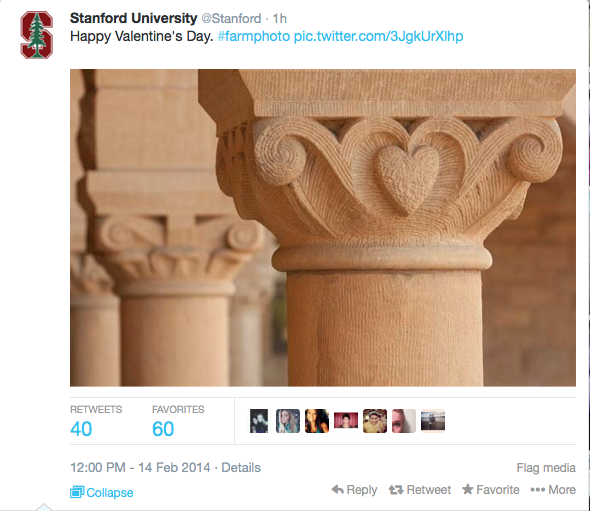 Stanford were sharing photos too – highlighting the love of tradition on their campus. Another bastion of US tradition, Harvard, reminded us all of its love of heritage with some insight into its library and arts courses. 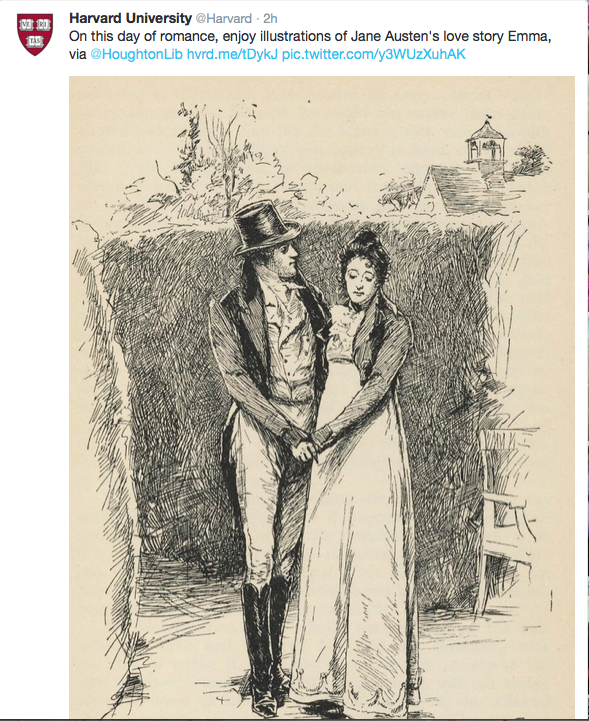 We’re not sure what Ms Woodhouse would have made of being part of a Twitter news-jack though! 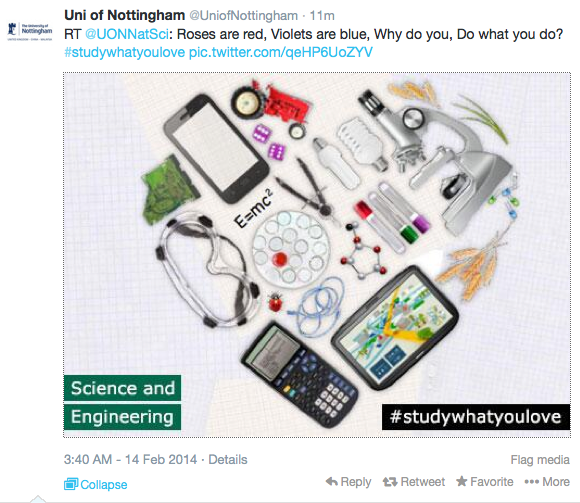 Meanwhile, the University of Nottingham have been very creative with subject imagery to remind everyone that despite all the ’employability’ pressures out there it is important to choose a course you truly love. 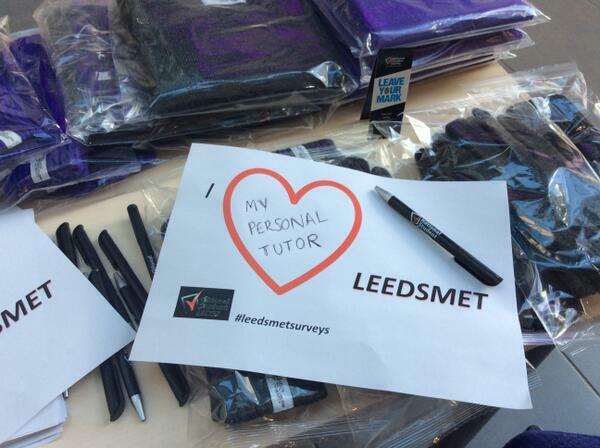 Leeds Metropolitan University undertook a real-world exercise to understand what their students really loved, or didn’t! Universities need to do more of this and sharing the output through social media is a good way of opening up the conversation. 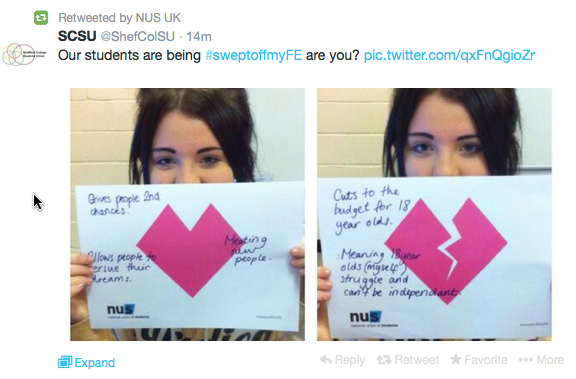 We also saw a hashtag sweeping our feet away on Valentine’s Day, this time in FE, with more feedback being sought via #sweptoffmyFE – after all, a good relationship needs input from both partners. 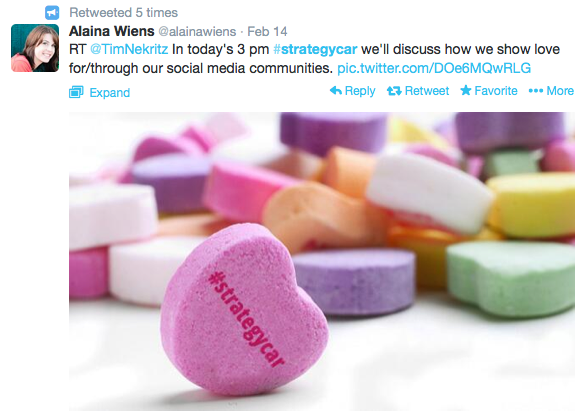 We enjoyed the Higher Education collaboration taking place at 3pm (EST) via #strategycar with institutions sharing some great ideas, mainly with a Valentine’s theme. They helped us to identify a few of the examples on here so thanks @alainawiens and friends! 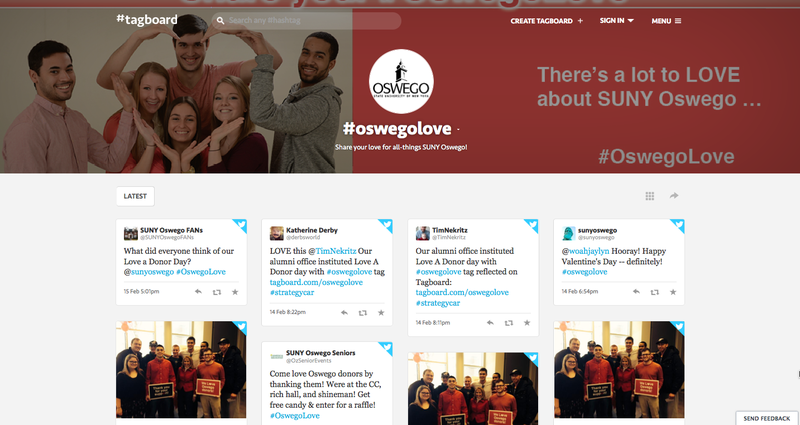 A great example of mixing the best in social media technology with Valentine’s Day was this from #OSWEGOlove as their fundraising efforts reminded them to ‘love a donor’, all hosted on their Tagboard. Many of the best Higher Education websites now are content-led, with home pages regularly taken over by the latest news. You have to love this home page on February 14th. More websites need to be this striking, relevant and simple. 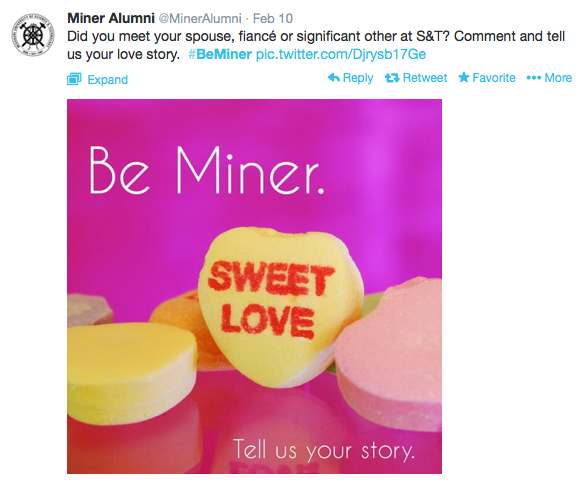 Finally, we have to acknowledge the creative genius of the #MinerNation representing over 50,000 alumni, some of whom fell in love with each other whilst at college. Never has a B minor been so positive!